Tree stumps can be a huge nuisance for homeowners. Not only are they a huge eyesore, they can also be hazardous. A stump left behind can be a tripping hazard, fungus may begin to grow, they attract pesky insects, and the roots could pose a threat to your home’s foundation. These hazards can turn into very costly problems later on. Our licensed arborists are experienced in stump grinding to take the difficult task off your hands. It can be extremely difficult to dig out a tree stump. For someone who is inexperienced and lacks the knowledgeable of stump removal, it can begin a long process. It is also very costly if you don’t already have the right equipment required to remove one. At Fort Smith Tree Care Service, we use the most effective methods for stump grinding in order to remove the entire tree stump and roots. 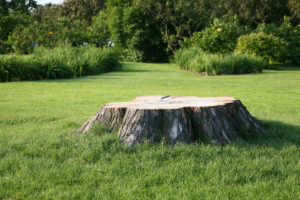 Our professionals have been in the business of tree care and removal for a long time and can remove a stump quickly. Our specialized machinery can remove a tree stump of any size. Safety and customer satisfaction are our top priorities. We can quickly give you an accurate quote before sending a trained specialist out to your property. They will evaluate the stump and begin the removal process. You can rest assured knowing that all the roots will be removed and all the debris will be cleared away once the job is done. Your lawn will look much more pleasant in no time. You don’t have to continue living with a potentially hazardous tree stump in your yard any longer. Fort Smith Tree Care Service offers very reasonable and fair prices for stump grinding and removal. We have been in this business for years and guarantee customer satisfaction. Our friendly service and licensed arborists are dedicated to making sure all your tree care and removal needs are met.